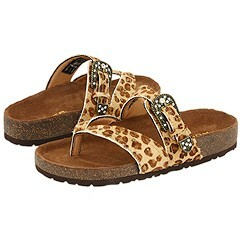 * Display your inner fashionista in casual, comfortable style with these cute Animal Print sandals by Roper. * Leopard print pony hair upper on leather with stud details. * Adjustable buckle across the instep with sparkling jewels for added bling. * Cushioned EVA footbed for lightweight comfort. * Rubber outsole for durability. Roper is the largest manufacturer of both footwear and apparel within the western industry. The company’s casual clothing and footwear for men, women and children are sold exclusively through western retailers across the United States in more than 2,000 stores. Roper’s vision for growth can be traced all the way back to the young man who founded the company 59 years ago. Fresh from the service to his country during World War II, Sam Mandelbaum returned to work in production and merchandising at Miller Western Wear. In 1948, after being overlooked for a promotion, Mandelbaum decided to strike out on his own. With enthusiasm, his knowledge of the Western wear industry, and dedicated work ethic, Mandelbaum, with the financial backing of Jack Karsh, opened Karman Inc. In recognition of a lifetime of contributions to the industry, Sam Mandelbaum’s peers named him to the Western Image Awards Hall of Fame in August of 2003. The leadership of Karman Inc. is now in the hands of Sam’s son, Gary Mandelbaum. Gary shares his father’s vision for growth and continues to make the corporation successful. Karman Inc. is unique in the industry of being one of the only Western apparel and footwear manufacturers and distributors for Roper brands. Whether you are looking for casual shoes or hard working boots, Roper has got you covered. Roper designs and manufactures a wide array of boots and shoes for every aspect of the modern cowboy?s life. Roper?s beautifully designed boots and shoes are made from the highest quality materials. From rugged work boots to fun western fashion, Roper boots are made to last.